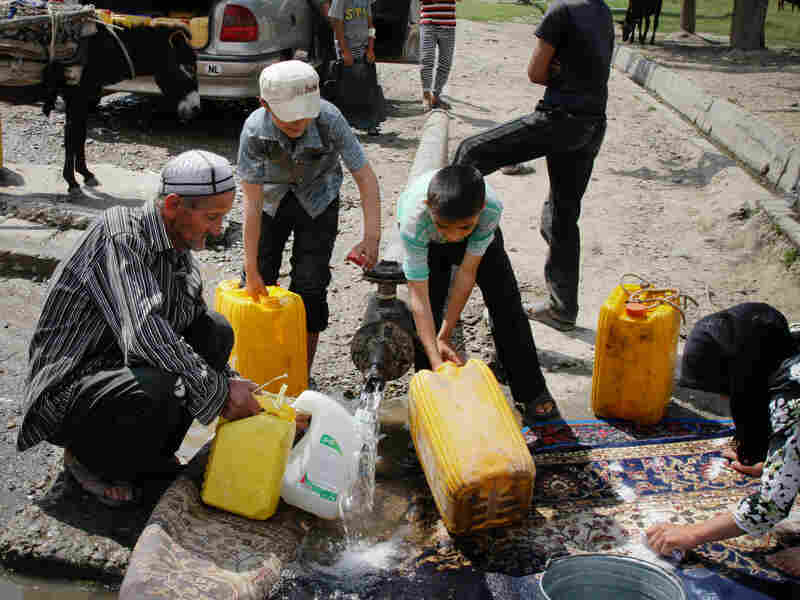 Rich With Water But Little To Drink In Tajikistan : Shots - Health News Many families in rural Tajikistan spend hours each day collecting water from communal spigots or nearby rivers, where the water often isn't safe. When one village gets a new water system — and a tap in each yard — residents have more time to grow food and earn money to support their families. Nazarali Murodov says it takes him two to three hours each day to collect water for his family in the village of Navbahor, Tajikistan. The Central Asian nation of Tajikistan has huge rivers. They begin atop some of the world's highest mountains and then flow west through the country's lush, green valleys. Yet for many Tajik families, getting enough water each day is still a struggle. Nazarali Murodov, 66, fills up jerrycans at a broken water pipe in Navbahor, Tajikistan. During the Soviet era, he says, it was easier to get clean, safe water. A study by the United Nations last year found that most Tajiks lack access to safe, clean water. Many people rely on rivers and open ditches for drinking water, which are often fouled by animals, agricultural runoff and even human sewage. The situation has gotten steadily worse as infrastructure built by the Soviets has decayed and failed. "In Soviet times there were water stands for every 10 or 15 houses in a village. It was better," says 66-year-old Nazarali Murodov, as he waits for water from an open, rusted pipe in the village of Navbahor. Murodov has brought his donkey cart to the pipe. The animal is loaded with yellow plastic jugs and large metal milk cans. Getting water is one of his family's most crucial daily chores, he says. "If someone is free, he goes to fetch water and spends two to three hours to do this." Murodov can haul about 50 gallons of water on each trip with his donkey. His family of 10 uses one load each day, just for drinking, cooking and cleaning. If he has time, Murodov tries to make a second daily trip to the well, so he can irrigate the family garden. 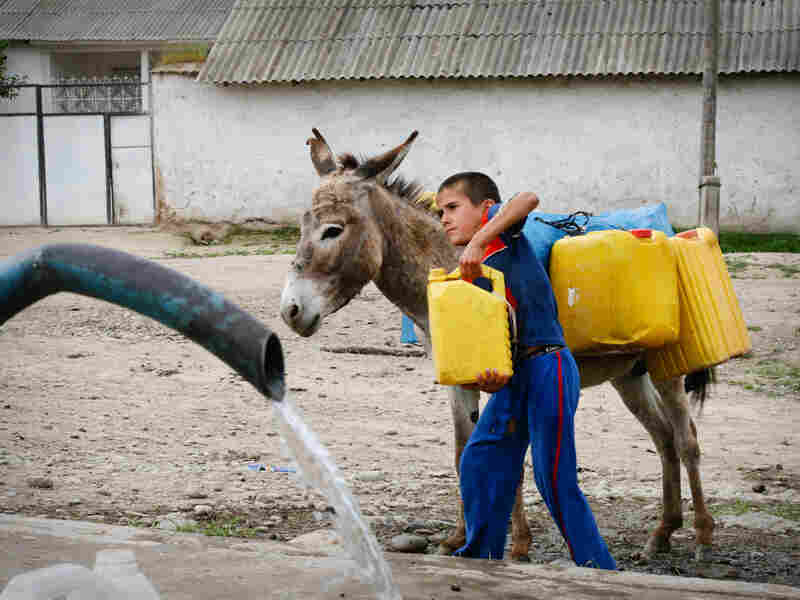 A boy collects water at a new spigot in Shululu, Tajikistan. Before the government built a new water system, villagers were allocated half-hour time slots to collect water from a trickling tap. The area around the village water pipe is busy with activity. Two young men are loading jerrycans into the trunk of a rusted Lada sedan. Some kids have come with jugs tied on their bicycles. Several girls are scrubbing carpets in the gravel-lined puddle below the spilling pipe. There's no spigot or shut-off valve. The water just pours out of the broken, corroded pipe. "Ten or 15 years ago, there was a pump here and a nice water stand. But it's all gone," Murodov says. "No one cares about this now." During the Soviet times, there were functioning water systems throughout most of Tajikistan, says Davide Costa, of the nonprofit Oxfam. But that infrastructure went in to decline toward the end of the communist period and hasn't been maintained since. 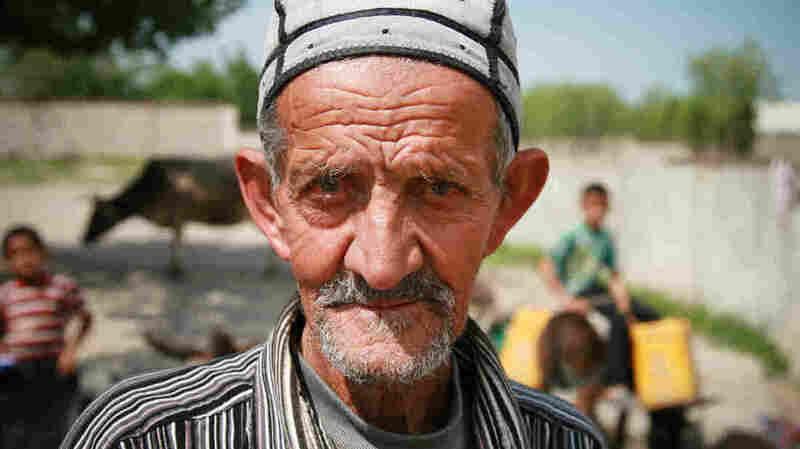 Now just about 5 percent of the population in rural Tajikistan has safe water, he says, "which is nothing." Access to adequate sewage facilities is also dismal in much of the country, and has led to repeated outbreaks of typhoid and other waterborne diseases. Easy access to water can transform lives, and some parts of Tajikistan are getting the help they need. In the neighboring village of Delolo, the local government finished a new gravity-fed system to help ease the water shortage. The project, funded by the Swiss government's international development agency and the nonprofit Oxfam, brought a tap into each family's yard. Before the local government built a tap in her yard, Rahmonova Parvina, 26, used to spend half a day trekking up and down a hill to get water. Now she says that she has time to earn money by sewing. Before the system started working, Rahmonova Parvina, 26, says she would spend half of each day trekking up and down a hill to get water. "I don't have a donkey," she says. "I went to fetch water two or three times a day. From the early morning to the afternoon, I only fetch water. And then for the half day, I did some housework or supervised my kids if I have a spare minute." Tajikistan is squeezed between Afghanistan, Uzbekistan, Kyrgyzstan and China. Roughly 1 million of the country's 7 million people work abroad as migrant laborers. Women, like Parvina, are often left to run the households, which includes making sure there's enough water. Parvina says having a tap in her yard has changed everything. Now she has more time for her kids. She can irrigate her vegetable garden. Parvina's husband works in Russia and sends money home to support the family — covering most of their expenses. But Parvina says she now also has the time to sew traditional Tajik dresses and earn her "own money." 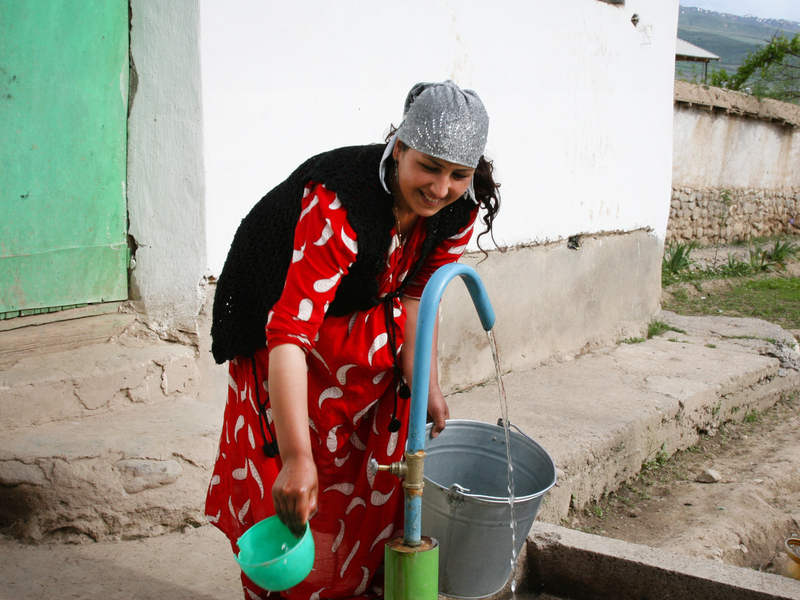 Oxfam has built three such village water systems in Tajikistan and plans to build 40 more, owned and run by locals. Villagers still have to pay for the clean water they use, Costa says, but that's a good thing. It encourages conservation, and provides funding to maintain the systems for future generations.